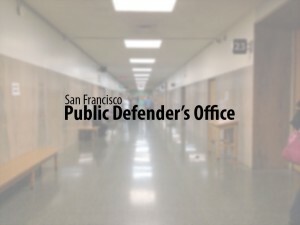 San Francisco– Two cases of people charged with domestic violence ended in acquittal this week after juries examined the evidence and decided that each one was based on false assumptions, Public Defender Jeff Adachi announced today. Elijah Watson, 38, and Chenille Moldovan, 43, were both found not guilty after altercations with their partners lead to their arrests. Mr. Watson was charged with a felony and faced up to five years in prison; Ms. Moldovan had a misdemeanor charge and faced up to a year. In Mr. Watson’s case, a skirmish in which his girlfriend was the aggressor led to bystanders assuming that he was the one at fault, Deputy Public Defender Bonnie Chan said. “This case involved a whole bunch of misconceptions based on gender roles,” Ms. Chan said. “It’s something that we deal with on a day to day basis in court. People assumed that he was the aggressor and caused her injury because he was the male, but the jury was able to put aside those stereotypes and make a proper ruling.” Mr. Watson testified that he attempted to remove car keys from his partner’s hand and she struggled with him and fell on her rear end. As he tried to help her up, she kicked Mr. Watson in the face with her high heel and continued to swing at him, the jury learned. Mr. Watson attempted to restrain her, and in doing so, the police were called. Ms. Moldovan’s case, the dynamic was one of “power and control, intimacy or eviction,” said Deputy Public Defender Brandon Banks. “My client lived with the complaining witness, and though she was the one who called the police, she was still the one arrested because the complaining witness was more educated, well put together, and paid the bills,” he said. The complaining witness came home to find Ms. Moldovan in his home, a place she had been living for quite some time, the jury learned. He demanded his keys back and an argument ensued. The witness claimed that she punched him in the face five times, though the District Attorney could offer no evidence that he was ever injured. In the end, the jury ruled in Ms. Moldovan’s favor and she was acquitted.